The human knowledge frontier grows every day as new discoveries are captured in our various databases. 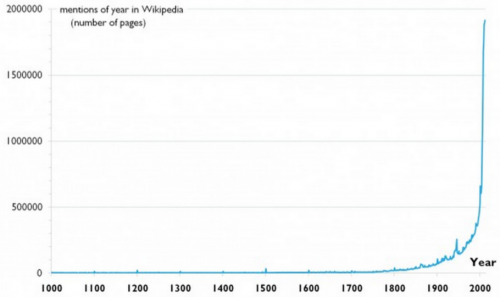 A common image often shown is the ever increasing (exponential) body of human knowledge. The curve is neat and suggests a forever accelerating growth of our knowledge. However, those not keen to the distinction between knowledge and intelligence can easily be mislead into believing that modern people are also more intelligent than our ancestors, and that human intelligence will continue to grow unconstrained. In this scenario, our full understanding of all mysteries of the Universe is just a matter of time. Many behave as if human intelligence is already infinite and we only lack full knowledge of the Universe due to temporary technological delays. The “almost infinite intelligence” assumption is understandable given that mankind is so much more intelligent than any animal species. However, various measures loosely correlated with intelligence – including number of neurons, brain size and volume – indicate we are not so outstanding. 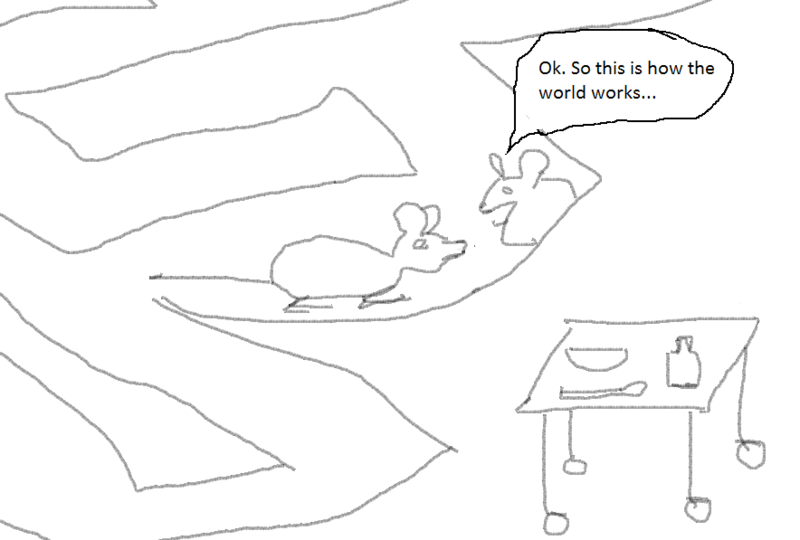 Furthermore, at times many humans have been outsmarted by motivated animals of all sorts. Studies have shown that intelligence does not increase over one’s lifespan despite presumable significant knowledge accumulation. We are therefore likely not more intelligent than our ancestors that lacked all our heritage and modern tools. 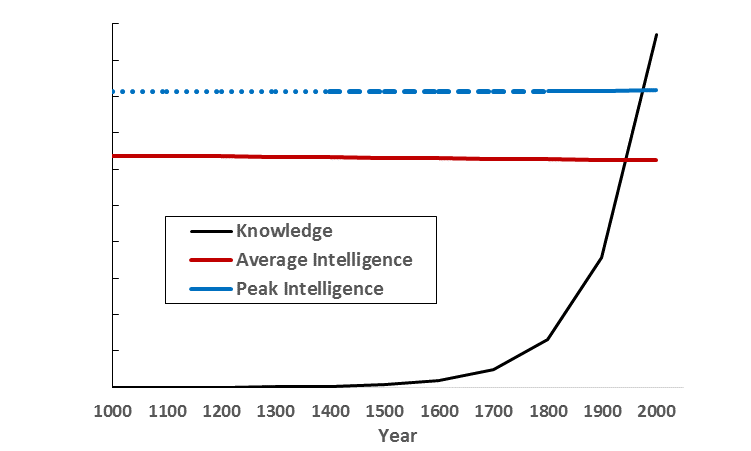 The average intelligence has thus been flat or even declining while the peak intelligence has had more and more representatives over time, but not necessarily more intelligent individually. But why does it matter, and who needs a let down? Won’t we achieve more being overly optimistic rather than pessimistic about our intelligence? Actually, realism is better than both too much pessimism and too much optimism. The problem with pessimism is the widely accepted fear of underachievement. Exaggerated optimism is even more destructive as it can lead to misallocation of resources and worse. Numerous historic episodes of taming the nature, controlling the economy, and social experiments have resulted in rather large catastrophes – all due to the overconfidence in human intelligence. Presumably, more intelligence and knowledge is better than less so, what can be done? It appears that intelligence capacity is genetic, but only a [yet to be defined] perfect early childhood can develop one’s full potential intelligence. While intelligence is said to peak before the age of 20, knowledge continues to grow. Unfortunately, human lifespan is limited and every new generation needs the right environment and a long time just to match the previous generation’s intelligence and knowledge, thus allowing the smartest of that generation to advance the cutting edge of knowledge. Collective or swarm intelligence seems higher than individual intelligence (ants, bees, etc.) but, beyond a minimum threshold, increasing the size of the collective does not seem to make it more intelligent. Human groups can be more efficient (as in markets) and better organized than a single person or elite group could impose, but again, increasing the size of the group does not guarantee better results. Artificial Intelligence is viewed by many as a way to augment or replace human intelligence. Indeed, we were able to augment our mechanical powers many times beyond those of our natural body. However, we did that by applying intelligence to increase physical power. What other than human intelligence would we apply to develop artificial intelligence? It takes a certain level of intelligence to build a machine as smart as a human. How convenient but unlikely would it be that this level of intelligence required was just below our own peak intelligence? And from there, how would a machine bootstrap its own intelligence to a higher level? Eventually, the machines are also supposed to gain conscience and willpower as if these were just regular milestones in a linear progression? Bootstrapping human intelligence to a higher level through chemical, genetic and other means has also been pursued. Simply adjusting one or more of the measures correlated with intelligence is likely to result in very limited upside to human peak intelligence as suggested by the natural variations of human intelligence that includes a downside as low as “braindead”, but not an upside as high as a “best one person musician-painter-physicist-chemist-physician-etc.” or a “best-by-far one area expert”. Not only is our brain finite, but our abilities are also limited. In addition to lifespan and individual development requirements, our senses, needs, and physical characteristics restrict our experiences even with the help of technological progress. And without the proper experiences commensurate with the brain capacity, intelligence becomes limited. Pro: AI is just a tool that helps its human designers beat the other humans at Chess and Go. AI is like a power tool to mechanical power. Humans build high-rises and dams, not the tractors and cranes by themselves. Posted in Views and tagged Artificial Intelligence, human intelligence, knowledge frontier, swarm intelligence.